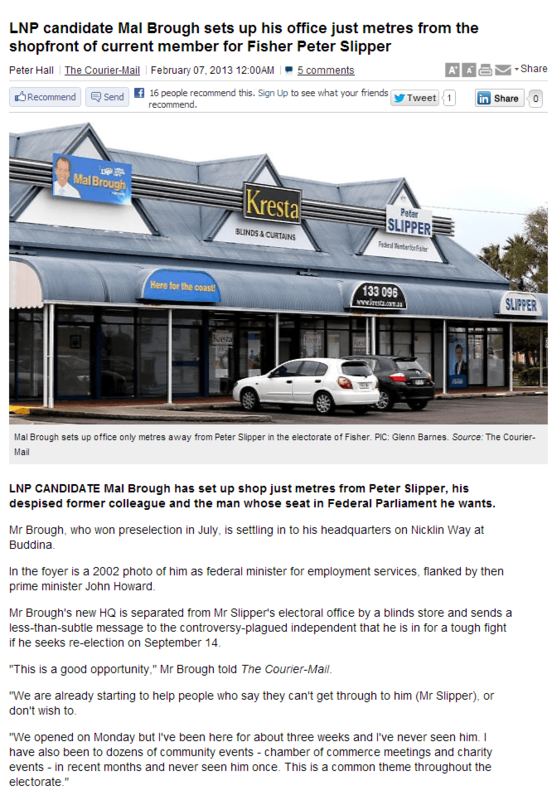 A long, day for Mal Brough, from ‘up yours’ fluff to, well…. The Courier Mail had a soft story on Mal Brough where they forgot to do journalism and ask the hard questions. @phonytonyabbott @the_daily Proud mastheads chase NEWS – hoped @couriermail would show Southerners how it's done re #Ashby #Brough. @phonytonyabbott, @couriermail learnt heaps by Southern Media shaming re police corruption under Joh. #Ashby scandal home turf gold. Sad. A. Mr Brough was not linked to this scandal by the Gillard Government, he was linked to this scandal by the Federal Court of Australia, Justice Rares. You may like to familiarise yourself with the judgement “Ashby v Commonwealth of Australia (No 4)  FCA 1411”. In fact Mr Brough is referred to 113 times in this judgment. My second point of order here is in relation to ‘leak diaries’. Not sure about you, but if I ‘encourage’ a staff member in a competitors business to STEAL & COPY pages of my competitors diary to give to me to gain an advantage, that is actually THEFT and pretty sure I would be in serious doggy doo should I be caught, as is the case here? Much to my disappointment the journalist has not asked any pertinent questions of Mr Brough in regard to his involvement in this scandal. I do not know of this journalist, though considering how hard it has been for others of his profession to actually get Mr Brough to answer his phone, this is such a wasted opportunity. See graphic above, (larger version here), in fact more than just the journo’s on this graphic have tried to contact Mr Brough, even though he was very very cute in an interview with the Sunshine Coast Daily where he suggested no-one had phoned him? Mr Hall obviously missed the opportunity for a ‘scoop’ here, alternatively it begs the question, was not asking anything serious about Ashby a condition of the interview? “Mr Slipper’s now about to face court next week and be charged … on criminal offences relating to allegations of misuse of travel [entitlements]. “There is nothing more to add. There is no other meetings, connections or whatever else,” he told ABC News. “All of the discussion, the text messages – of which there is about half a dozen at most – are all there for anyone to read. “I have nothing to be ashamed of or would change. “A person (James Ashby) came to me for assistance. I suggested that they go and get legal advice. I suggested they go to police if they believed a crime had been committed. When pressed about the court’s finding that he and Mr Ashby had worked “in combination”, Mr Brough said he was not party to the court action and was not being judged. OMG Brough speaks about #Ashby. http://t.co/EHhRK68Z And lies again. Stolen 2012 diaries zilch to do with Slipper summons – 2010 travel. Sam Rutherford who tweets under the handle @mephiztopheleze created a fantastic WANTED Poster. Now here is how YOU can make a difference. 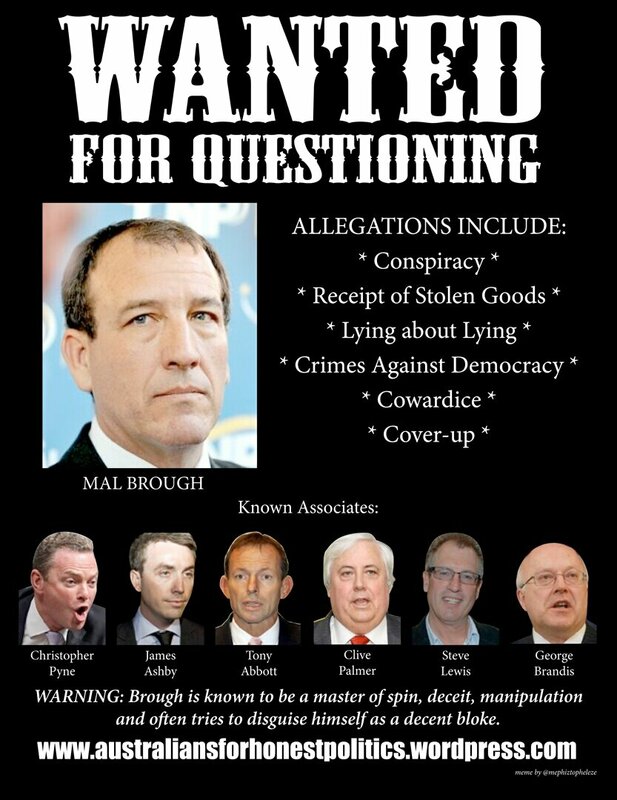 Download this Mal Brough Wanted A3 PDF and share it around. Print it out and put it on all the street corners (or whereever else is allowed and/or suitable) in Mal Brough’s area. Here is a precedent of using pictorials rather than words to express an opinion. Australian artist Robert Bosler, at Margo Kingston’s Web Diary is being quoted by Margo. 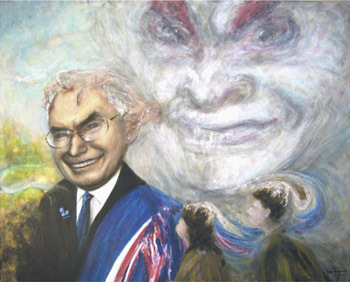 The painting hung just two doors up from the PM’s Bennelong campaign office during the 2004 federal election, see the story. The painting is a must-see – that’s why it’s here. Oh, and it’s called “False Prophet”. More stories on Mal Brough and Ashbygate here. Not only is there a resounding silence, the ABC has taken to blocking question, most notably with Pyne on Q&A and after 6 attempts in pointing this out in forums I have not been able to get one post through yet no problem till I mention the ABC’s lack of balanced reporting. Our ABC is no longer ours and apart from Australians for Honest Politics and the Independent Australia there are very few pushing for answers, I don’t think people realize just what is at stake if we allow these things to go unchecked. Do people think that by allowing only one side to be held to account that it will be accepted? If we do not have people held to account then there is no need for others too and if we are not going to play by the rules then other will not play by the rules, so it’s no great leap to see how far things like this can drag us down. Mal’s a good bloke. Family man and great minister. Honest as they come. Can’t wait for the election and watch the left thrash around in shock at their destruction.